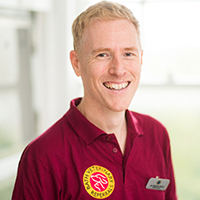 Jon graduated from the Liverpool vet school in 1998 and worked in first opinion practice. In 2004 he was awarded the RCVS Certificate in Small Animal Surgery and Jon became the surgeon for a busy small animal hospital in Gloucestershire. He also saw referral cases in the Bristol area as a visiting surgeon. Jon has a wide range of surgical experience, in recent years focusing primarily on orthopaedic cases including joint surgery including TTA, corrective osteotomies, fracture stabilisation and arthroscopy. He also regularly performs spinal surgery for treating acute disc extrusions. He has a special interest in the use of CT for planning tailored treatments for the hind limb deformities that cause patellar luxation. Outside of work Jon spends time with his family and enjoys cycling, music and technology. Casamián-Sorrosal, D., Fournier, D., Shippam, J., Woodward, B., & Tennant, K. (2008). Septic pericardial effusion associated with pulmonary and pericardial botryomycosis in a dog. The Journal of Small Animal Practice, 49(12), 655–659.